I arrived in Los Angeles, en route to Las Vegas when Kev told me that there was a change in plans with the itinerary. Originally, the plan was for me to fly in on Friday and we drive in together with his S65 AMG, taking turns to cover the 245-mile (394km) journey. 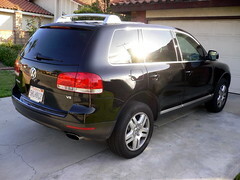 As it turned out, he was leaving for Las Vegas that very afternoon and leaving me the keys to his spare VW Touareg. I took it for a spin and it was a wonderful piece of work. V8 engine to give you the power you need on the highways and despite the clunky appearance of a typical SUV, this is certainly no slow poke and certainly very limber. 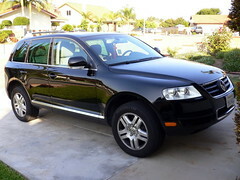 Word has it that the VW Touareg rolls off the same assembly line as the Porsche Cayenne which, if anyone remembered, was a car I was closed to driving on one of my earlier trips. Too bad. I guess this is as close as driving a Porsche as I'd ever get. Anyway, the interiors are very well done and sans the sunroof, Kev got all the options installed. My only gripe in particular is the GPS taking a darn long time to initiate when you are starting up the car. Still, while it still may be faster than the Kev's wife's Mercedes Benz CL500 but only because the latter's GPS software on board the CL500 was faulty. Software wise, Mercedes Benz' GPS software is still far superior to that of this VW and the BMW. In general, both will still get you to the destination but it is the Mercedes Benz' attention to details that won me over. One particular example would be that after you key in the City, Street and House Number of your destination, typical GPS navigation would simply tell you that you are reached your destination when you eventually get there. Mercedes Benz' software goes a step further and tell you that your destination is on the left side or right side of the road. This is especially useful when you are unfamiliar with the place and you are driving really slowly coz you can't find the exact spot as you are looking at the wrong side of the road. Anyway, coming back, while V8 means power, it also means gas guzzling. 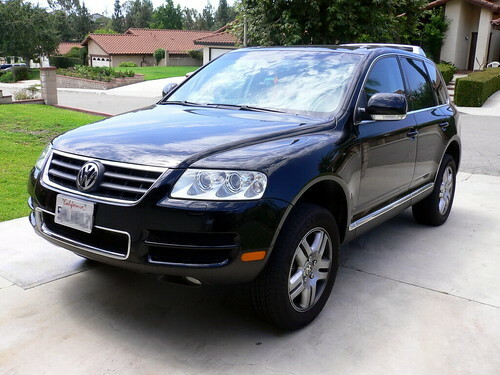 V8 + SUV = Get Ready To Sell A Kidney. I just fueled up last night ahead of today's trip and an almost full tank (from just below the 1/4 mark) cost me USD 61.00 (SGD 92.17) for 20.7 gallons (76 litres) @ USD 3.039 per gallon (SGD 1.213 per litre). If were in Singapore where the petrol prices are higher, I'd be sure I would be staring at 3 figures everytime I were to fill it up. Ouch. SUV is definitely a No-No for me if I had a choice. I still think a fuel efficient car is the way to go. Good for the pocket and good for the environment. Will update more when I start my journey into Las Vegas. I pray for journey's mercy. WOW! S65 AMG! that's obscene amount of power & $$$ ;P so is Bentley or Maybach his next target? Spinnee: It is artificially inflated to feed the greed of the oil companies but prices are due to come up even if they stayed honest for fossil fuel is being depleted faster than they are being form at the rate that we are using. slurp! : Ahhh... finally someone who recognises an AMG. The next car could well be a Bentley or a Ferrari, although not in the immediate future. I will keep everyone posted as soon as I get a chance to test drive it. Am sure you know this already, but Europe is already paying alot for petrol/diesel. at the mo, we're looking at close to 1 pound (SGD3) per litre. I filled up from almost empty tank last week and it cost me 40+ pounds (> SGD120). The good thing is, my car's pretty good at being fuel efficient (40 miles/gallon). Germany is not far behind in the costs (hence why those living near borders go 'across' to eastern europe to fill up - abit like the singaporean habit oh...10 years ago before the govt stepped in?!!). Unfortunately, most of it is tax and profit though... so the only pple who benefit are the oil co and the govts....We were recently in America where we hired a car and the cost of refueling was ridiculously low, to be honest. and this cost difference has nothing to do with standards of living. Arghhhhh... I miss Las Vegas!!! Miss the roller coaster ride at New York, Treasure Island and Bellagio!!! Ferrari? that a totally different class of car all together leh? BRABUS tuned V12 S Biturbo comes with 750hp .. madness!!! anyway, this AMG IS definitely bloody FAST, no doubt about it! But I'm really more interested in their very advanced active suspension system. i read that there is a switch that allows you to select amount of body roll you want to reduce. Pam: Well, let's put it this way. I am sure the oil companies have contributed a lot of money into the politician's campaign fund allowing them to get into and become part of the gahmen successfully. Kelly: Wanted to catch Penn & Teller but my kakis all not interested leh. Other than hitting the tables, I have a cool outing last night at the Roof Bar at Rio (51st floor). Excellent view. Legs got a bit wobbly when I got too close to the side. Slurp! : No reviews on the S65 AMG this time as I have covered it liao. Click the link in the entry for the review. This time round it was a laid back drive as I maintain the speed at a modest 110 mph (180 km/h). When it comes to climb up slope from 0 to 4000+ ft above sea level over a distance of 15 miles, I was comfortably overtaking everybody. Oh yah, we also equipped the car with the ValentineOne, that was super accurate when it comes to detecting traffic police's radar gun. I encountered 3 of them along the way and they were 2 miles ahead which gave me ample time to slow down and avoid getting booked.